Visual marketing is a form of marketing that focuses on design elements and visuals within an advertisement or promotional piece, like email marketing materials and more. This form of marketing is especially useful for social media where images are shared significantly more often than text posts or articles. If you want to improve your social media engagement with visual marketing, there are many simple tips that you can follow to make this promotional strategy work for your business. Keep reading below to find out our top visual marketing tips on social media. Infographics are an excellent combination of images and information. If you are trying to get information out to an audience, this is the way to go. 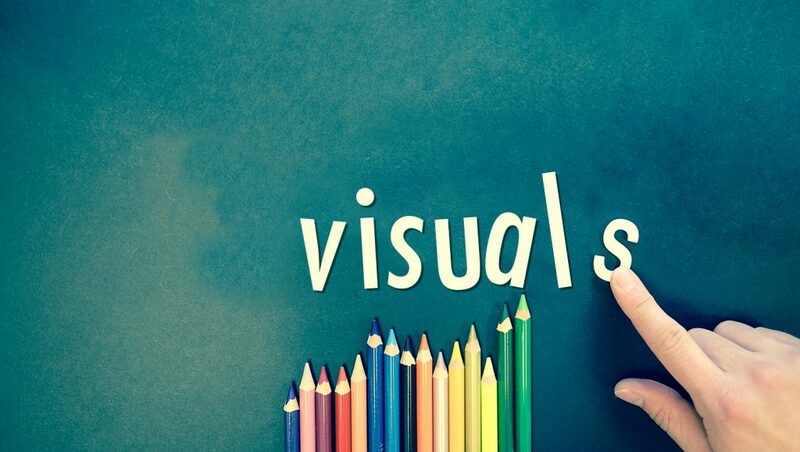 Visual marketing relies on the sharability and eye-catching aspects of an image. By creating a useful and visually pleasing infographic you will ensure that more users stop to read the information. Do not be afraid to use stock images with your digital content. Many marketing professionals are under the impression that stock images are a death sentence for digital marketing content. This is not true. You just have to be sure to use high quality stock images. High quality stock photography should be relevant to your content. It should also include stock photos your audience or target customer segmentation relates to. Take the time to edit and crop stock photos to ensure that they meet these goals. As long as you take these precautions, stock photography will have no bearing on the success (or failure,) of your content marketing strategies. Memes are an incredible force in pop culture. That is why you should leverage memes as a visual marketing tool. Creating your own meme to advertise a product, company or service on social media is one of the best ways to generate a lot of attention for your brand. However, it is important to consider whether memes are an appropriate piece of visual content for your particular demographic. If you have a young target audience and want to create a community surround your brand, consider creating your own memes. Visual media does not focus solely on photographs. Gifs, videos and even textual art can draw viewers in to your salon franchise social media profiles. Rather than posting the same stagnant images on your social media, try to keep an appropriate mix of various media to keep your followers engaged. By including a variety of different visuals in your social media accounts you will create a more interesting an appealing profile. Crowd sourcing content is an excellent use of both your followers and visual marketing. Encourage them to share images of their favorite product and feature their images on your own page. This moment of recognition will make your followers happy, and you will get to show off some of your top selling items! Hashtags and promotional contests are a great way for others to share images and videos about your brand, so keep this in mind the next time you are developing a new marketing strategy. Making high quality posts is the key to visual marketing. This goes for both the content and the actual images involved. Be sure that all of your shared images and videos are taken with a good camera. This will give an heir of professionalism and help capture your viewer’s attention, much like the Hubspot pricing calculator. Additionally, make sure that your shared items are relevant, interesting and informative. Posting just for the sake of posting is no way to gain followers. Another great way to engage with your audience is to include personal looks into your business. Sharing office photos, new product designs and other behind-the-scenes content will invite consumers into your community culture. This is especially important for millennials, who are quick to dismiss traditional marketing and advertising strategies. Featuring images and profiles of your best employees can also help customers see the face behind the business, which will make them that much more invested in your brand. Visual tutorials are an excellent way to be both informative and engaging. Take a tip from Farmers insurance. Rather than typing out a how-to article on your blog, try compiling a list of gifs that represent how one of your products can be used or set-up. This will give consumers a proper look at what your goods and services can really do. Visual marketing is an excellent tool for businesses that want to improve their social media engagement. Videos and images, when utilized correctly, are shareable content that everyone can enjoy and understand. Be sure to consider these top six tips above the next time you are working on a marketing strategy.